KW United finds success, is Canada ready for next step? 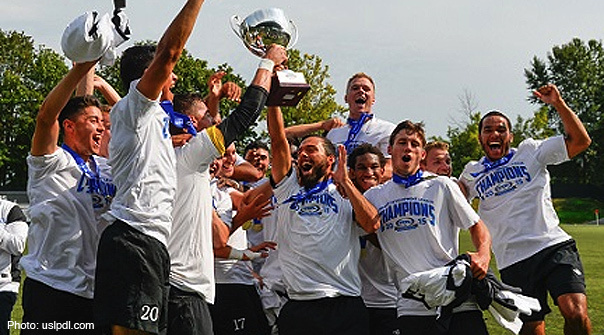 Through an extremely busy summer of soccer in Canada, as well as Southern Ontario, it would not be surprising if most people were unaware that K-W United won the PDL championship in the fourth highest tier of soccer in North America. K-W United beat the NY Red Bulls U-23 side 4-3 in the final. For more information about the PDL this year you can read my league review at ProspectXI. K-W United finished the season, including playoffs, at 15-2-1 playing in the very competitive Great Lakes Division that includes last year’s champion Michigan Bucks, past PDL winners Forest City London and new to the PDL scene TFC Academy. TFC had a season to forget finishing 3-8-3 with their only wins against other struggling teams the Pittsburgh Riverhounds U-23 and Derby City. TFC II are also struggling badly in their first season in USL, while Toronto FC are also currently seventh in League One Ontario, a league they dominated the season before. In total, the three Toronto FC youth teams have a combined record of losing twice as many games than they have won. I wrote an article when it was announced that the Canadian MLS clubs would be getting USL clubs. I warned all about the issue of players playing in a league over their head, especially Canadian players with limited experience and how the successful reserve teams the season before, such as LA Galaxy II, were able to blend prospects with proven players at the USL level. Vancouver took some of this into account when putting their USL team together, while Toronto and Montreal didn't, and Toronto is currently tied for the worst team in the league and Montreal have only improved recently and are still eight points out of the playoffs. In some ways, the same could be said about the lack of success in the other two leagues. A combination of naivety and arrogance has put a group of players on the pitch who in many cases are unprepared, but a greater issue is at their current ability are just not good enough. Part of the problem is Toronto FC being the only MLS club not to participate in the USSDA, an elite academy league which over the past five years has developed most of the young talent entering MLS. Outside of Montreal, Toronto FC have the least amount of homegrown players, who are playing or have played NCAA Division 1 soccer, and it’s no surprise their best player in USL this season has been Jay Chapman, while at the PDL level it was current Duke University player Kevon Black and former Sigma Academy player and currently at Evansville, Mark Anthony Gonzalez. I would also say part of the issue, since Toronto FC doesn't have past experience in USL or PDL, they don't really understand the goal of those leagues for MLS clubs. USL, which for MLS is now a reserve league, has been traditionally for young talent combined with giving first team bench players minutes. So it is confusing when you look at TFC II and saw Bright Dike never playing before being cut or either has Daniel Lovitz and Nick Hagglund. Even Montreal has used some first team players and trialed Kenny Cooper at FC Montreal to see if he was worth signing by the first team. Meanwhile, MLS clubs such as Seattle and Portland use PDL to bring in top college prospects and to get exclusive scouting opportunities of the player in anticipation for the upcoming draft. TFC Academy brought in no one from outside, instead Toronto FC have used both USL and PDL to give academy players minutes which might turn out to be useful experience, but does very little in club development unless Toronto FC is committed to these players for the next four or five years and hope after 100 games or so they are good enough to play in MLS. It’s nothing new in saying that the Toronto FC organization has issues, or is even inept in many facets, so let’s return to K-W United. With all the talk of a professional league in Canada the question becomes how do you develop a club that is good enough so people attending games are at least getting their money’s worth? K-W United was a club going into this season not about development but to be competitive in the league and the unfortunate truth is most of Toronto FC’s teams are Canadian, while K-W United’s roster has less than half Canadian players. However, the Canadian players on K-W United have a successful track record considering their age. Sergio Camargo is a prospect with Coastal Carolina, Mathieu Laurent plays soccer with UAB, Nathan Ingham played four years with Florida Gulf Coast, all in NCAA Division 1 soccer. Justin Springer is a three year starter with Guelph in CIS, while Jarek Whiteman and Dylon Sacremento play at York University after years with Camargo part of Toronto FC Academy, and finally Wesley Cain has a long history with the Vancouver Whitecaps residency. Of the non-Canadians, nine of them are currently or have played Division 1 soccer. Ben Polk was a star in Junior college and just signed with NCAA Division 1 school Syracuse. Juuso Pasanen played on successful academies in Finland, Oyvind Alseth in Norway and Julian Buescher in Germany are also with Syracuse. Adam Polakiewicz played professionally in Poland as well before college. Ken Krolicki and Nicholas Ciraldo both came from the Columbus Crew Academy and played in the USSDA. K-W United is on average a year older than the TFC Academy and compared to PDL players, although have also played at least five more years of highly competitive soccer on average. Most TFC Academy players were playing in local Toronto youth soccer leagues with the exception of Gonzalez, Daniel Jodah, Ryan James and Darrin MacLeod. So if a new Canadian league club is going to be realistically better than a K-W United team, the number of Canadians also playing NCAA Division 1 soccer is going to need to increase as well. Added will be the need for players with a number of years of PDL or League One Ontario experience and a quality youth development upbringing. It’s not difficult to see soccer is booming at the moment. As K-W United won the PDL title, over 18,000 showed up to see Chattanooga FC lose to New York Cosmos B in the NPSL final. We also wrote articles on ProspectXI about the most successful season in USSDA and the Academies for MLS clubs such as Real Salt Lake and Chicago Fire and the quality of players they are developing. From an MLS perspective, I'm worried that the Canadian clubs are not keeping up with the American teams, especially now since most players are signed via Homegrown contracts instead of the Draft. Looking at the 2016 MLS prospects (most who will be playing on a B team in USL next season) it’s not surprising to see a player play 100 USSDA Academy games, 70 NCAA Division and 40 PDL games by the time the player is 21, and this doesn't include High School or being with the National team. In comparison, it is not unusual that a Canadian might play 100 competitive games, if lucky. Outside of a lack of coaching, the two biggest complaints I hear by the soccer community in Canada is kids play too many games or they don't play enough. To the too many games criticism I will say you are not aware of how soccer is treated elsewhere in the World. In most cases if a kid chooses to be a soccer player, that is now their life from the age of 14. In terms of not enough, despite the losing I do feel the experience of USL, PDL and L1O is good for the development of the players as long as they stay committed and the club remains committed to them. Although at the current pace, we will not see the results of this effort for four or five more years. Probably the most disappointing aspect of this story is K-W United’s reported attendance this season was only 136 per game, down from 700 in 2013. I will also say for PXI we wanted to do a special on a Canadian PDL club and after initial communication the conversation ended. It seems most PDL clubs, including anyone who has history with Toronto FC, they like to remain on their own island and not try to include the community, be it soccer or municipality as part of the team. In terms of a Canadian Soccer League, I'm split on the idea. I know there are quality players who would love to play soccer throughout the summer in Canada. The game is also improving greatly from people's awareness, to the ability including Canadians in terms of how they play the game. I also see the success stories in Detroit, Sacramento or Chattanooga, which could easily be Hamilton, Calgary and Winnipeg. My concern is the potential laissez fair attitude of if you build it things will work out. As we see from the struggles of Toronto FC II and other TFC youth teams, having a club doesn't mean automatic success. Or in the case of K-W United, even winning doesn't mean interest. So my worry is we, meaning Canada, might not be ready just yet.